Is it possible to make a delicious gluten-free banana pudding completely from scratch? I found out the answer to that question this weekend is: “You’re darn tooting!” I found the recipe below on about.com. We started by making some simple vanilla wafer cookies and then let them cool. We then made a homemade vanilla pudding and layered that with bananas and then topped the whole thing off with meringue. Make sure you chill this really well before serving though as it is best cold. Preheat oven to 375F. Line 2 large baking sheets with parchment paper. Combine eggs and sugar in large mixing bowl and beat on high until creamy (3 minutes). Add vanilla, lemon and salt. Beat to combine and then gradually add flour and xanthan gum. Beat until just combined and slowly drizzle in melted butter into mixture. Drop dough by rounded teaspoons and leave 1 1/2 inches between cookies. Dip glass in sugar and lightly press down on each cookie. Bake for 12-15 minutes until cookies are golden and crisp. To prepare pudding, combine sugar, cornstarch, salt and milk in a heavy saucepan and whisk to blend. Cook over medium heat whisking constantly for 7 minutes. Mixture should thicken and bubble. Boil for 1 minute while continuing to whisk and then remove pan from heat. Place egg yolks in a medium bowl and whisk to blend. Slowly drizzle 1/2 c of hot pudding into egg yolks whisking constantly to temper the eggs. Drizzle egg mixture back into pan with hot pudding and return pan to heat while whisking constantly. Cook for about 2 minutes (mixture should just start to bubble) and then remove from heat. Stir in butter. Preheat oven to 425F. Place some wafers in the bottom of each ramekin and layer 1/4 c pudding on top. Layer some bananas on top of pudding and then repeat with one more layer of pudding and one additional layer of bananas. Layer more wafers around the inside of the ramekin. Prepare meringue by placing room temp egg whites and cream of tartar in medium mixing bowl. Beat on high for 2 minutes until mixture is frothy. Add sugar 1 T at a time until mixture is glossy and peaks form, but don’t overbeat. 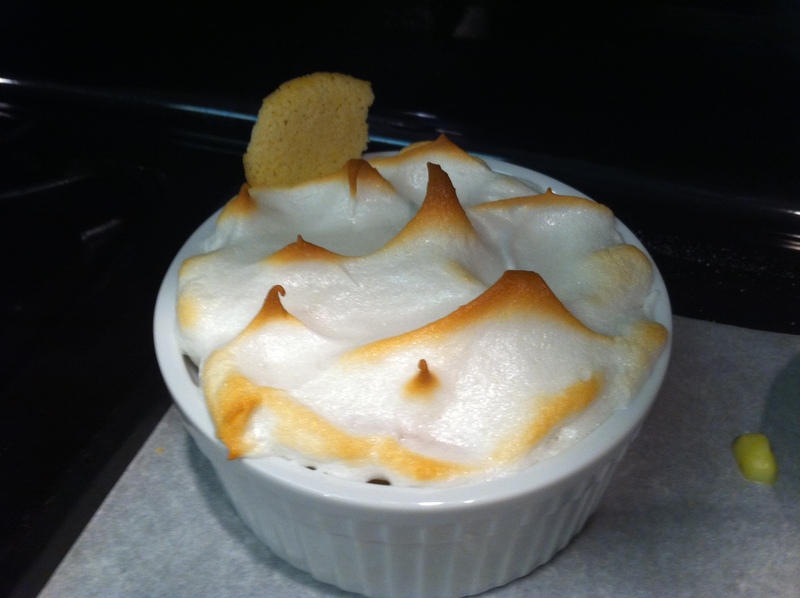 Use a spoon to mound meringue on top of each ramekin and bake for 5-8 minutes until meringue is golden brown. Cool for 30 minutes and then refrigerate for at least 1 hour. 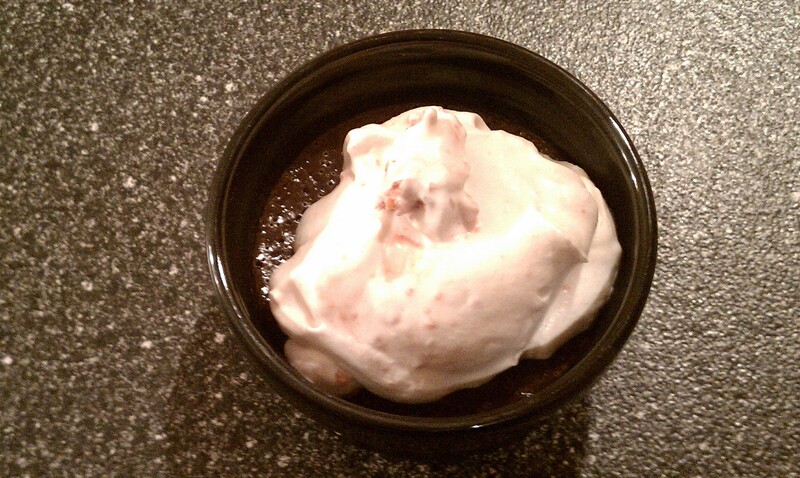 I watched an episode of 5 Ingredient Fix recently and saw Claire Robinson make this easy chocolate dessert topped with a cherry whipped cream. I had to try it for myself and it was fabulous! If you don’t like the taste of dark chocolate try making this with milk chocolate instead. Preheat oven to 350F and bring 6c of water to a boil on the stove. Put the chocolate in a heat-proof bowl. In a medium saucepan over medium low heat bring 1 1/2 c heavy cream and sugar to a low simmer making sure sugar has dissolved. Pour the hot cream mixture over the chocolate and whisk until all the chocolate has melted and it is smooth. Add a small amount of the hot chocolate mixture to your egg yolk bowl and whisk to temper them. Transfer the egg mixture to the chocolate mixture and whisk to thorughly combine. Transfer the mixture to a liquid measuring cup and pour into 4 small ramekins filling evenly. Put ramekins in a high sided baking pan and fill the pan with hot water halfway up the sides of the ramekins. Bake about 301 minutes. The custard should be slightly jiggly when you remove it from the oven. Cool the custards to room temperature and then refrigerate them for 2 hours or overnight. Whip the remaining 1/2 c heavy cream with 1tsp of sugar until stiff peaks form. Whisk the cherry jam until loosened adding 1-2 T of water to thin it out. 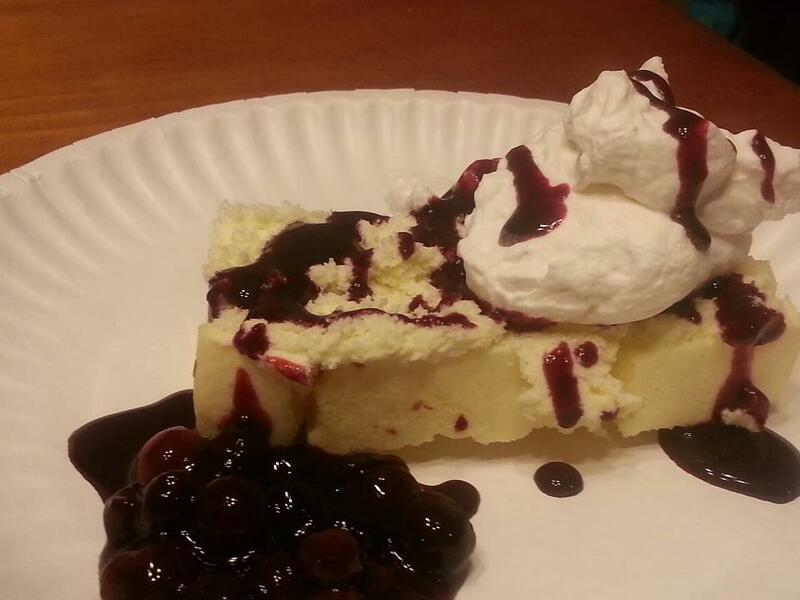 Fold the jam into the whipped cream and top the custards.